Our institutional policy has been to perform wide excision of these lesions, aiming for a 1 cm margin, with appropriate reconstruction. In doing so, we can offer good local control rates without compromising functional and esthetic outcomes. The purpose of this study was to describe our experience treating either primary or recurrent ameloblastoma of the maxilla or mandible with wide excision and microvascular reconstruction, and report our local control, functional, and esthetic outcomes. A retrospective review of records for patients treated with wide excision and microvascular reconstruction for maxillomandibular ameloblastomas at Amrita Institute of Medical Sciences Kochi between 2003 and 2015 was performed. Clinical and pathological features were described, and a literature review was performed. All patients had preoperative computerized tomography (CT) scans or orthopantomograms (OPG) and histologically proven ameloblastoma of the maxilla or mandible. All patients underwent wide excision of the lesion with a gross 1-cm bony margin and microvascular reconstruction with bony or soft-tissue microvascular flaps. Local control was determined by calculating time elapsed between the date of surgery and date of the first detection of recurrent local disease. Functional outcomes were reported in terms of speech intelligibility, adequacy of oral intake, trismus, and dental rehabilitation. Esthetic outcome for available patients was scored on the visual analog scale (VAS) for esthetic satisfaction. 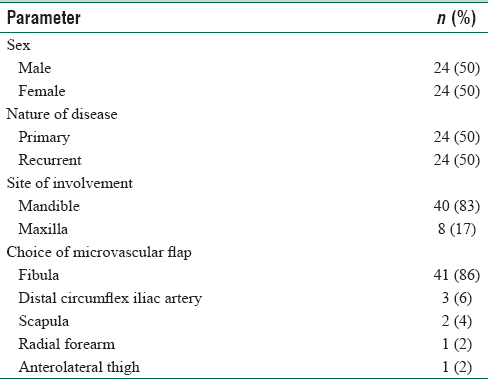 Patient characteristics are shown in [Table 1]. A total of 48 patients were identified, with an equal gender distribution. The mean age of the patients was 35 (range 16–71). Half of these patients had recurrent disease. Forty of these patients (83%) had lesions involving the mandible, and the remaining 8 (17%) had the maxilla as the involved subsite. All of our patients underwent wide local excision with gross 1-cm bony margins and reconstructed with microvascular flaps. Median follow-up was 21 (6–84) months. In all patients with maxillary tumors (n = 8) and mandibular patients having expanded outer cortices that precluded preplating of the mandible intraoperatively before performing the bony cuts (n = 30), we used preoperative planning and modeling with rapid prototyping technology and stereolithographic models. These models were printed based on the craniofacial CT, and a mock surgery was performed on the model to ensure accuracy; the exact extent of resection, and the planned osteotomies on the bone flap. Reconstruction plates were prebent to ensure accuracy and to save operative time. The hardware used for bony reconstruction of the mandible was 1.7-mm profile thickness mandibular reconstruction plates and 1.5-mm size profile screws with a length of 8 mm or 10 mm. For maxillary reconstruction, 1.5-mm profile mini-plates were sufficient as the maxilla is not a load-bearing bone. The flaps used were fibula free flap in 41 (86%), distal circumflex iliac artery flap in 3 (6%), scapula flap in 2 (4%), radial forearm free flap in 1 (2%), and anterolateral thigh flap in 1 (2%). All flaps survived. Three patients (6%) had minor wound complications who were managed conservatively. No patients had significantly donor site morbidity. Histological characteristics are shown in [Table 2]. The mean tumor length was 4.73 (range 2–14) cm. Three patients (6%) had positive bony cut margins on histology, and all of them underwent re-excision with final negative margins. The histological variants of ameloblastoma were follicular in 20 (42%), acanthomatous in 10 (21%), desmoplastic in 5 (10%), a basal cell in 2 (4%), and unspecified in the remaining 11 (23%). Functional outcomes are shown in [Table 3]. All patients had good speech intelligibility, as assessed in person or over the telephone. All patients had adequate intake, with a solid or semi-solid diet. Two patients had mild trismus (4%), measured as an inter-incisor distance of <3 cm. Dental rehabilitation was successfully performed 40 patients (83%), with 12 receiving osseointegrated implants and the remaining receiving removable partial dentures. Esthetic outcomes were measured in 30 patients (63%) using the VAS for esthetic satisfaction. 28 of these patients (93%) had a satisfactory score (>8/10). Four patients (8%) had scar revisions subsequently, following which their esthetic satisfaction improved. The general agreement that ameloblastoma is odontogenic in origin occurs largely on the basis of the histologic similarities of the tumor and the developing enamel organ.,,,, Theoretically, it may arise from the cell rests of the enamel organ, from a developing enamel organ, from the epithelial lining of an odontogenic cyst, or from the basal cells of the oral mucosa. In many cases, the diagnosis of ameloblastoma is not established until the lesion is advanced, with a cystic enlargement of the mandible or maxilla, by which time the resection required is significant. Ameloblastoma is a common condition that needs to be diagnosed early with a high degree of suspicion to avoid extensive surgery. Although pathological correlation is necessary, a thorough knowledge of the radiological appearance can help establish the diagnosis early. Lesions are generally expansile and radiolucent, which can be unilocular or multilocular with a typical soap-bubble appearance on OPG and CT. In addition, cross sectioning imaging demonstrates cystic areas of low attenuation interspersed with isoattenuated areas, which represent the soft-tissue component of a tumor. Later on, lesions can erode the cortex and tooth roots. Even if ameloblastoma is considered to be benign, it is locally invasive with a high rate of recurrence.,, Its biological behavior has caused great controversy in its management. Proposed treatment options for ameloblastomas vary from conservative measures, such as marsupialization, enucleation, and curettage, to radical treatments such as disarticulation, or marginal and segmental resection.,,,,,, Conservative approaches had a high rate of recurrence ranging from 55% to 90%, but radical treatments resulted in lower recurrence rates but were burdened by serious cosmetic, functional, and reconstructive problems.,, Previously, nonvascularized bone grafts were used to reconstruct these lesions. However, it is well known that the resorption rates are high due to the inability to withstand the physiological stress of the masticatory load. Re-establishing mandibular integrity needs to be considered the current standard of care. The mandible plays an important role in maintaining facial contour, mastication, speech, and swallowing. Defects resulting from mandibular resections for tumors affect the quality of life in patients with regard to chewing and cosmesis. With the advent of microvascular reconstruction, the quality of life has greatly improved in patients undergoing segmental mandibulectomies. With radical reconstruction and microvascular reconstruction of these defects, we were able to achieve an excellent local control rate, even in recurrent lesions that had recurred up to four times previously. In the small percentage of patients who had final bony margins positive, we performed a re-excision until the final bony margins were negative. Through rapid prototyping and stereolithographic modeling, we were able to achieve alignment of bone flaps, especially in cases where dental rehabilitation was subsequently performed. The ideal configuration of bony and soft-tissue components allowed us to best re-establish normal anatomy and physiology for excellent speech and swallowing outcomes, in spite of radical resection. It is crucial to note that the success in managing these patients came from the technical proficiency of a large team, which included the head-and-neck surgeons, plastic surgeons, craniomaxillofacial surgeons, prosthodontists, and swallowing therapists. The multidisciplinary approach allowed the patients to benefit from combined expertise for optimal functional and aesthetic outcomes. Wide excision and microvascular reconstruction for maxillomandibular ameloblastomas, results in excellent local control, functional, and esthetic outcomes. For complex defects, stereolithographic models and rapid prototyping help optimizing reconstruction, especially when dental rehabilitation is planned. Although managing these patients is challenging, multidisciplinary expertise and planning are crucial for successful management. Gupta B, Ponniah I. The pattern of odontogenic tumors in a government teaching hospital in the Southern Indian state of Tamil Nadu. Oral Surg Oral Med Oral Pathol Oral Radiol Endod 2010;110:e32-9. Reichart PA, Philipsen HP, Sonner S. Ameloblastoma: Biological profile of 3677 cases. Eur J Cancer B Oral Oncol 1995;31B: 86-99. Mendenhall WM, Werning JW, Fernandes R, Malyapa RS, Mendenhall NP. Ameloblastoma. Am J Clin Oncol 2007;30:645-8. Fregnani ER, da Cruz Perez DE, de Almeida OP, Kowalski LP, Soares FA, de Abreu Alves F, et al. Clinicopathological study and treatment outcomes of 121 cases of ameloblastomas. Int J Oral Maxillofac Surg 2010;39:145-9. Funk W, Podmelle F, Guiol C, Metelmann HR. Aesthetic satisfaction scoring – Introducing an aesthetic numeric analogue scale (ANA-scale). J Craniomaxillofac Surg 2012;40:439-42. Simon EN, Merkx MA, Kalyanyama BM, Shubi FM, Stoelinga PJ. Evaluation of quality of life among patients after extirpation of mandibular ameloblastoma. East Afr Med J 2005;82:314-9. Villaret AB, Cappiello J, Piazza C, Pedruzzi B, Nicolai P. Quality of life in patients treated for cancer of the oral cavity requiring reconstruction: A prospective study. Acta Otorhinolaryngol Ital 2008;28:120-5. Gorlin RJ, Chaudhry AP, Pindborg JJ. Odontogenic tumors. Classification, histopathology, and clinical behavior in man and domesticated animals. Cancer 1961;14:73-101. Kim SG, Jang HS. Ameloblastoma: A clinical, radiographic, and histopathologic analysis of 71 cases. Oral Surg Oral Med Oral Pathol Oral Radiol Endod 2001;91:649-53. Weber AL, Kaneda T, Scrivani SJ. Cysts, tumors, and nontumorous lesions of the jaw. In: Som PM, Curtin HD, editors. Head and Neck Imaging. 4th ed. St. Louis, Mo: Mosby; 2003. p. 930-94. Minami M, Kaneda T, Yamamoto H, Ozawa K, Itai Y, Ozawa M, et al. Ameloblastoma in the maxillomandibular region: MR imaging. Radiology 1992;184:389-93. Thompson LD. Ameloblastoma. Ear Nose Throat J 2003;82:19. Chana JS, Chang YM, Wei FC, Shen YF, Chan CP, Lin HN, et al. Segmental mandibulectomy and immediate free fibula osteoseptocutaneous flap reconstruction with endosteal implants: An ideal treatment method for mandibular ameloblastoma. Plast Reconstr Surg 2004;113:80-7. Gardner DG, Pecak AM. The treatment of ameloblastoma based on pathologic and anatomic principles. Cancer 1980;46:2514-9. Robinson L, Martinez MG. Unicystic ameloblastoma: A prognostically distinct entity. Cancer 1977;40:2278-85. Li TJ, Wu YT, Yu SF, Yu GY. Unicystic ameloblastoma: A clinicopathologic study of 33 Chinese patients. Am J Surg Pathol 2000;24:1385-92. Gardner DG, Corio RL. Plexiform unicystic ameloblastoma. A variant of ameloblastoma with a low-recurrence rate after enucleation. Cancer 1984;53:1730-5. Sehdev MK, Huvos AG, Strong EW, Gerold FP, Willis GW. Proceedings: Ameloblastoma of maxilla and mandible. Cancer 1974;33:324-33. M−ller H, Slootweg PJ. The ameloblastoma, the controversial approach to therapy. J Maxillofac Surg 1985;13:79-84. Leider AS, Eversole LR, Barkin ME. Cystic ameloblastoma. A clinicopathologic analysis. Oral Surg Oral Med Oral Pathol 1985;60:624-30. Rogers SN, Devine J, Lowe D, Shokar P, Brown JS, Vaugman ED, et al. 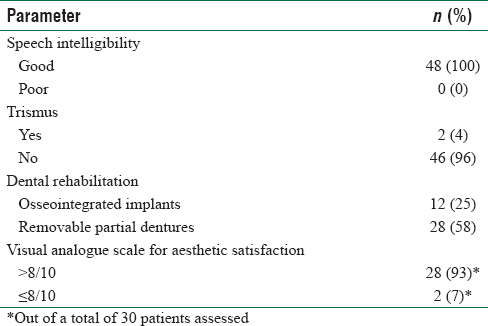 Longitudinal health-related quality of life after mandibular resection for oral cancer: A comparison between rim and segment. Head Neck 2004;26:54-62. Hidalgo DA, Pusic AL. Free-flap mandibular reconstruction: A 10-year follow-up study. Plast Reconstr Surg 2002;110:438-49.